Are you tired of looking at your tattoo that you wish you didn't get in the first place? Do you ever wonder if there is a way to get rid of it for once and for all? You´re not alone. Fortunately, there have been great advances in the Tattoo removal industry with improved technology that are more powerful and effective at clearing black as well as multi-colored tattoos in significantly shorter length of time than the most common laser device used today called the Q switch laser. Tattoo inks contain metals like lead, copper, manganese and mercury. These metals make tattoos permanent once injected deep into your skin. Your immune system recognizes these particles as intruders in your body. As a result, it releases white cells to get rid of these particles. The white cells work to remove these particles by sending them to the liver to be processed and excreted. However, the white cells are only able to handle a small amount of particles as the ink particles are too big. In order to remove a tattoo you need to break up the ink particles embedded into your skin. Lasers are able to do this by heating up the ink particle and making it expand but fast enough so that half of the particle remains cool. This hot and cool process rips the particle apart. The white cells are then able to absorb them and carry them to the liver to be eliminated from the body. The lasers don't burn the tissue. Instead, the energy collapses into a shockwave. The shockwave vibrates through the skin and causes the upper layer of skin to lift up and appear white or frosting. 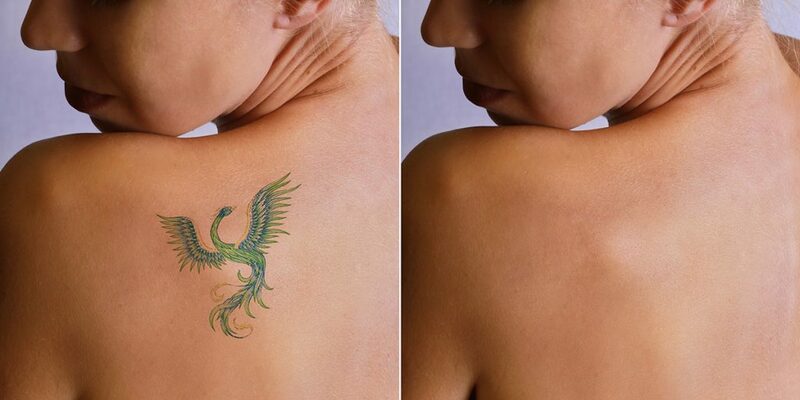 Not all laser tattoo removal devices are created equal. Choosing the right provider and laser device is critical to your success. Trilogy Health is proud to offer one of the most advanced laser systems for tattoo removal called the Enlighten, introduced in 2014. It offers dual wavelength (1064 nm and 532 nm) and dual pulses (picosecond or nanosecond) technology allowing the provider more versatility and options for breaking down the ink particles in tattoos. These dual wavelengths have been shown to result in faster, less painful and fewer treatments than devices using only 1 wavelength. Tattoo area is cleaned with alcohol pads and numbing cream is then applied to area 30 minutes prior to treatment. Protective eye shields are worn during the procedure. 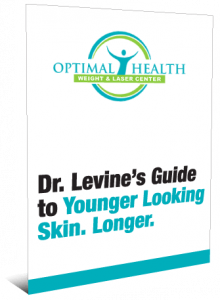 Your doctor will test your skin with the laser to determine the most effective energy for treatment. A handheld device will be used against the surface of the skin, activating the laser light to remove the tattoo. The feeling is said to be similar to a rubber band being snapped against your skin. Ice will also be available to minimize discomfort. The total number of treatments needed depends on different factors such as the colors and ink types used on the tattoo, the intensity of the tattoo, the size of the tattoo, and the body location of the tattoo. You should expect multiple treatment sessions. However, your provider can give you a better idea of the total number of treatments needed during your consultation and once your treatments begin. After the procedure, you may experience redness and swelling. However, these are only temporary side effects. A moisturizing ointment and temporary bandage is often all that is needed after treatment. Contact Dr. Ellyn Levine and her team of experienced medical providers specializing in Laser Tattoo Removal at Trilogy Health to get a free consultation. Learn more on their website, www.sdtattooremoval.com and watch Dr. Levine’s segment on CBS 8 San Diego demonstrating a treatment.